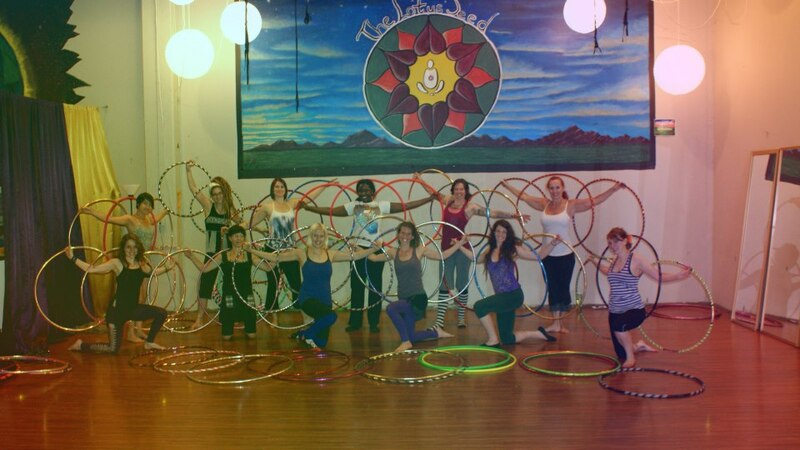 News flash: Revolva teaches “Multiple Hoop Mayhem” in Oakland, Sunday July 20 at Prop Box Studio (925 45th Ave, Unit #5). Due to years of hectic travel, Revolva has rarely taught in the Bay Area. Now, she’s home, and on July 20, you can add to your rotation with a class on multiple hooping. Please note: The original classes set for Dance Ground Keriac in July 19, including “Scribble Wobble,” had to be postponed due to lack of lead time to advertise. Revolva will try to reschedule them for the fall. In the meantime, enjoy “Multiple Hoop Mayhem” on a different day and at a different location. Sunday, July 20 * 11:30-1:00 p.m. In this workshop, we’ll begin by exploring multiple hoops on the arms and in the hands. We’ll then move on to the core. Using two, three, four and more hoops, we will create patterns inspired by modern hoop dance, as well as Native American and circus-style hooping. Increasing the amount of hoops you work with engages new and exciting parts of the brain, as well as several exciting muscles. Revolva has taught “Multiple Hoop Mayhem” across the U.S., in the U.K.—just never in the Bay Area. Don’t miss out! Refunds not available due to rapid approach of workshop. However, classes can be transferred to another student.